368 pages | 2 B/W Illus. The global space economy reached $330 billion in 2015, with a growth rate of 9 per cent vis-à-vis the previous year. 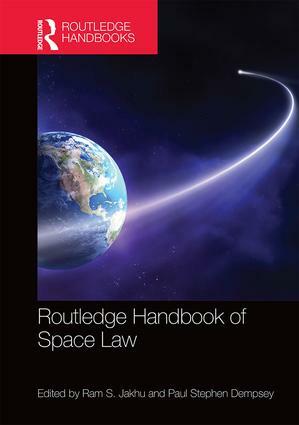 Consequently, Space Law is changing and expanding expeditiously, especially at the national level. More laws and regulations are being adopted by space-faring nations, while more countries are adapting their Space Laws and regulations related to activities in outer space. More regulatory bodies are being created, while more regulatory diversity (from public law to private law) is being instituted as increasing and innovative activities are undertaken by private entities which employ new technologies and business initiatives. At the international level, Space Law (both hard law and soft law) is expanding in certain areas, especially in satellite broadcasting and telecommunications. Ram S. Jakhu is Director of, and a tenured Associate Professor at, the Institute of Air and Space Law at McGill University, in Montreal, Canada, where he teaches and conducts research in International Space Law, Law of Space Applications, National Regulation of Space Activities, and Public International Law. He has served as Director of the McGill Centre for the Study of Regulated Industries from 1999 to 2004 as well as the first Director of the MSS Program (and Senior Faculty Member) at International Space University, Strasbourg, France, from 1995 to 1998. Paul Stephen Dempsey is Tomlinson Professor Emeritus of Global Governance in Air and Space Law and Director Emeritus of the Institute of Air and Space Law at McGill University. For more than two decades, he held the chair as Professor of Transportation Law, and was Director of the Transportation Law Program at the University of Denver. He was also Director of the National Center for Intermodal Transportation. Earlier, he served as an attorney with the Civil Aeronautics Board and the Interstate Commerce Commission (ICC) in Washington, D.C., and was Legal Advisor to the Chairman of the ICC.